Imagine your two-year-old scaling a six-foot wall. It might not be as impossible as you would think. 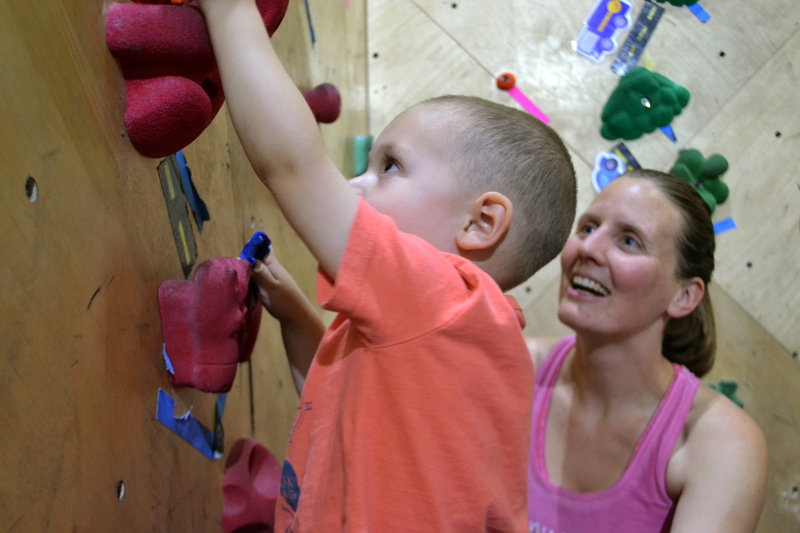 Rebecca Holwick of Peanut Butter and Jellyfish teaches young children in Reno to rock climb. Holwick can teach children as young as 18 months. Many may doubt that toddlers belong on the wall due to their lack of coordination. However, Holwick is out to prove them wrong. She matches her classes to her students’ skill levels and slowly creates tiny climbers, or as she calls them, natural monkeys. Beyond climbing, the children learn a wide variety of skills including fine and gross motor skills along with sharing, taking turns, sitting still, and every parent’s favorite, respecting adults. Holwick’s biggest concern is safety and she provides multiple ways for the tots to learn about the consequences of their actions. Every year approximately 2.8 million children in the U.S. experience injuries from falling that require emergency care. She wants her students to learn safe ways to climb as well as the correct method of getting down from a difficult position. To achieve the tasks at hand and to motivate the toddlers, she brings along toys for the children to retrieve. She hides matchbox cars and trucks in the climbing holds along the wall for the toddlers to find as they climb up. As a reward, she brings books to read and musical instruments. Every week has a new theme to keep the toddlers on their toes and interested in rock climbing. The idea for toddler rock climbing was born when Holwick realized that outdoor activities could be relaxing and useful for more than just adults. She first started Peanut Butter and Jellyfish as a swimming class; later she added yoga and finally rock climbing. In order to support her business, Holwick has taken a dramatic step. One ‘Peanut Butter And Jellyfish’ mom talks about the class. Two years ago Holwick left the comfort of her home for a new adventure. “Something that people might not expect from me is that I actually live in a tent in the middle of the woods,” Holwick said. Holwick’s move has allowed her to give all her resources to the program. Instead of paying for rent, she is able to buy more equipment for Peanut Butter and Jellyfish.